This Gin Za set of three bottles includes two excellent gins, the first in Japan to be produced using hops, and a spiced rum made by blending sugar cane based rums together. This Gin Za Japanese craft gin is the first gin created in Japan that uses Humulus lupulus, more commonly known as hops, a long with a range of intriguing botanicals. Citrus notes, such as orange and lemon zest, are the most apparent in this refreshing expression that is best enjoyed on the rocks or with a touch of tonic water. 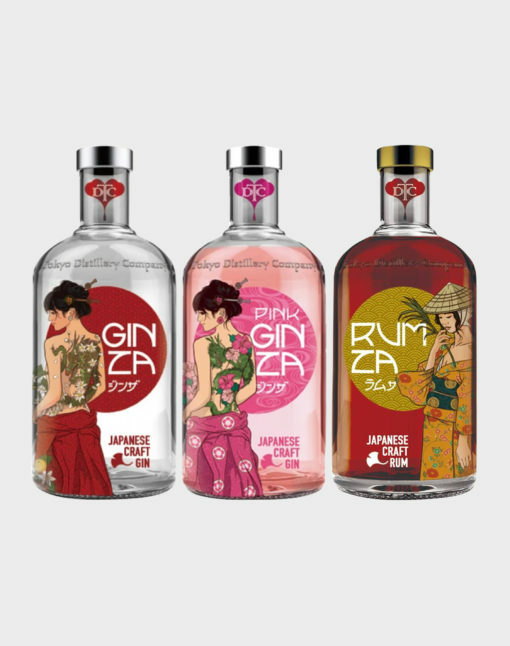 This Pink Gin Za Japanese craft gin comes from the first hops gin company in the country. It was created using citrus and a range of other botanicals used in traditional gin production with added hibiscus, giving it added depth and that lovely pink colour. This gin is perfectly suited to tonic or sparkling water with your favourite berries as garnish.